Get behind the smiles of many people and you’ll hear a story like this one. Sometimes you can see the deadness in their eyes. Life has not turned out as expected. Dreams die in a moment. What hope can I offer? As Paul says in Today’s Treasure verse, we sometimes feel as though a friend or even we ourselves have received a death sentence. Then Paul declares that when death stands at the door, we are forced to remember that we are not the answer for dying places. Only God, who raises the dead to life, can bring hope and help. But wait, God often calls on us to be the carriers of that help and hope. We won’t be much help, though, unless we rest confidently in what God has done and will do. I have brought forth a man with the help of the Lord! Notice the transformation in her thinking. God is the one who gave her the capacity to be a life-giver. Take a page from Eve’s life. 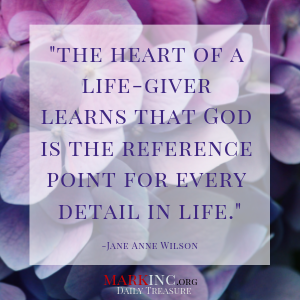 The heart of a life-giver learns that God is the reference point for every detail in life. The answers to all of our questions, including how to offer help and hope to hurting people, how to interact with a wayward child, how to help turn a grieving widow’s heart toward Jesus, and more, all come from Him. The widow in the beginning of this devotional is like Eve, broken hearted at the death of her dreams, the love of her life. Death creeps around her heart and home, but God is the one who raises the dead to life. She spills out her hurt to God and cries out to Him for help. There is hope for this woman, especially if a friend recognizes the opportunity to be a life-giver to her. Perhaps you are like that widow and you desperately need life-giving encouragement. Start as this widow does, cry out to the Lord, plead with Him to open your eyes to His presence. Personalize Psalm 23. Write it out in your journal with your name throughout, i.e. “Though I, Jane Anne, walk through the valley of death, the Lord will go with me. I, Jane Anne, will fear no evil…..” Ask the Lord to send you an encourager but also ask Him how you can be a life-giving encourager to others as well. Who needs your life-giving love today? Write their name in your journal and write one way you will express love toward them today. Father, we thank you for Your promise to send the Holy Spirit as our encourager. You are the ultimate Life-Giver and the ultimate Comforter. We pray that as we dig deeper into Your call for us to be life-giving encouragers, we will recognize the Source of all encouragement comes from You and Your love for us.